From African traditional to gospel, Bulgarian calling to barbershop, Elizabethan rounds to classical, rhythm and blues to rock ‘n roll, you name it ...they "doo-wop" it! This extraordinary female a cappella quartet demonstrates indisputably, that the possibilities for self-expression through voice alone are limited only by your imagination. 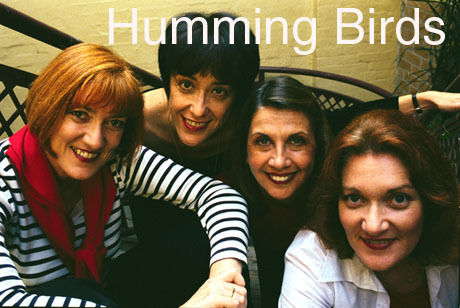 The Humming Birds were born of a cappella sensation Girls in Your Town, which delighted audiences Australia-wide from 1986 to 1995. Founding member Mara Kiek then re-formed the group as the Humming Birds. Together with former GIYT founder and bass singer extraordinaire Jarnie Birmingham, soulful blues/gospel singer Lisa Spence and amazing jazz vocalist Kate Swadling, the Humming Birds "...weave a tapestry of folk, pop, tribal, gospel, medieval and jazz". Since 1995 the Humming Birds have performed hundreds of school concerts and workshops for Musica Viva, and toured widely in New South Wales and Western Australia for Musica Viva’s Countrywide Concert Program. Sydney singers Zoe Georgakis, Virna Sanzone and Kristen Cornwell have also taken part in workshop tours and schools performances. The Humming Birds have performed extensive seasons of workshops and concerts for Musica Viva and Arts Northwest, toured to Singapore and Brunei for the Department of Foreign Affairs, and toured to Singapore for Musica Viva in Schools. Sydney performances include Angel Place Recital Hall. The Humming Birds appear on the soundtrack of the Universal Pictures film "Babe: Pig in the City".